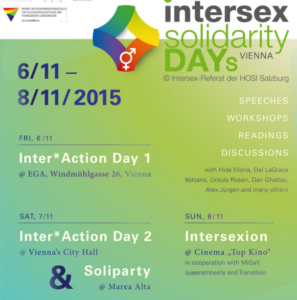 Hida Viloria | Keynote Presentation at Intersex Solidarity Days in Vienna! Keynote Presentation at Intersex Solidarity Days in Vienna! I’m excited to be invited by VIMO (aka OII Austria) and Platform Intersex Austria (PIA), to present at the Intersex Solidarity Days Conference in Vienna. I will be leading two 3 hour workshops alongside fellow activists, the fantastic Dan Christian Ghattas and Del LaGrace Volcano, of OII Europe, and also presented the keynote lecture at Vienna’s beautiful City Hall.